Location/ Directions: I-15 South/I-84 East, merge onto I-84 East via Exit 340 toward Riverdale/Cheyenne. Take the US-89 Exit, Exit 87, toward South Ogden/Salt Lake City. 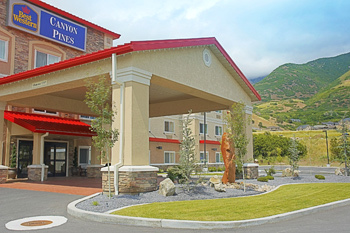 Turn left onto US-89 then get in the far right lane, just as you come from under the overpass you will see the BEST WESTERN Canyon Pines, then take the first right. About Hotel: Brand New. 3-Floors, 52-Rooms, Interior Corridors, High Speed Internet, Complimentary Breakfast, Fitness Center, No pets allowed, 100% non-smoking including public areas, Indoor heated pool, Hot tub, Exercise facility, 24-hour front desk, Laundromat, Free in-room wireless internet access, Business center, Air-conditioning, Elevator, Ice/vending machines, Free outdoor parking, Truck/RV parking, Cable or satellite television, CNN or other 24 hour news station, AM/FM alarm clock, AM/FM radio stereo, Coffee/tea maker, Microwave, Refrigerator, Hairdryer, Iron/ironing board, Desk/work area, Direct dial telephone with Speakerphone & Voice-mail, Free local calls under 30 minutes, Air-conditioning, Wake-up calls, Turn-down service, Sofa-bed available, Spa available, Adjoining rooms available, Crib available. Railroad View: Good View. Get a room on a high floor on the back-side of the motel for a railroad view. Two separate railroad lines can be seen from the motel. Railroads past Hotel: Union Pacific / Amtrak. 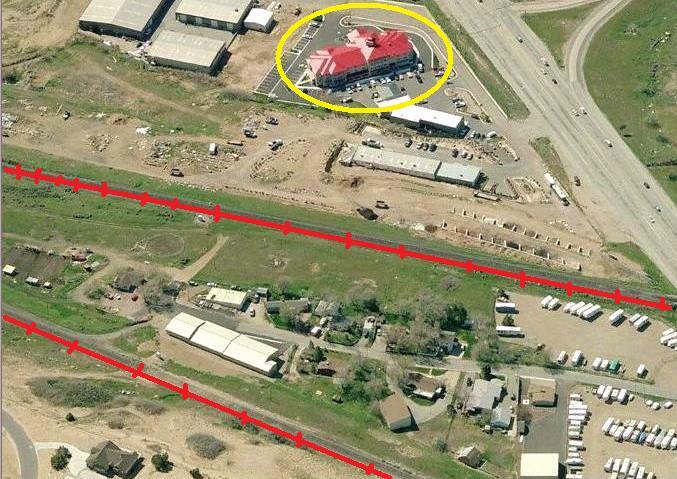 Photo Comment: The aerial photo shows the Best Western circled in yellow. The seperate railroad lines are marked in red. Expect a clear but distant view of the passing trains from the motel.